We welcome Sr. Andrea Koverman and the citizens of Cincinnati, Ohio: City of Peace. Sister Andrea and others have formed an organization, the Nonviolence Alliance of Greater Cincinnati, which is dedicated to building unity and fostering a culture of peace. Cincinnati has played a major role in abolitionism throughout history. Slaves used the Ohio River at Cincinnati to escape to freedom, often through the Underground Railroad–the heros who aided their journey through this network are recognized to this day in The National Underground Railroad Freedom Center on the Cincinnati riverfront. Abolitionists, such as Levi Coffin and Harriet Beecher Stowe have called Cincinnati their home, and the center of their anti-slavery efforts, with Stowe using her encounters in Cincinnati with escaped slaves for the basis of her book, Uncle Tom’s Cabin. Cincinnati has continued to set an ethical standard when tackling issues of race, well through the twenty-first century. In 2001, a police officer fatally shot an unarmed black man, Timothy Thomas, during an arrest for outstanding traffic warrants. The community’s response was one of unity; The Cincinnati Black United Front, the government, the police union and city came together in a symbolic and legitimate agreement upon a community-oriented policing strategy. The agreement has been used as a model across the country for building relationships between police and local communities. 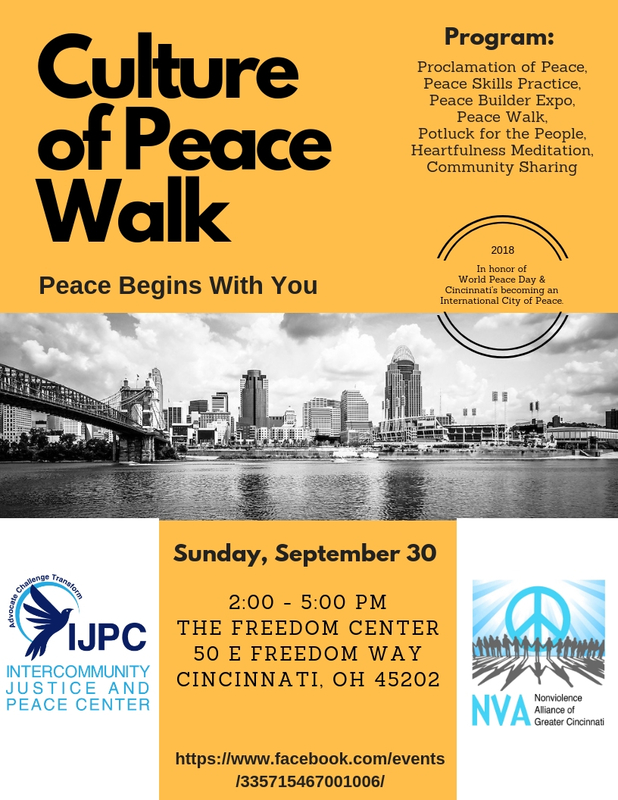 Peace, however, has not only been considered in regards to race relations in Cincinnati, rather there are countless organizations in all sectors of society pursuing peace. 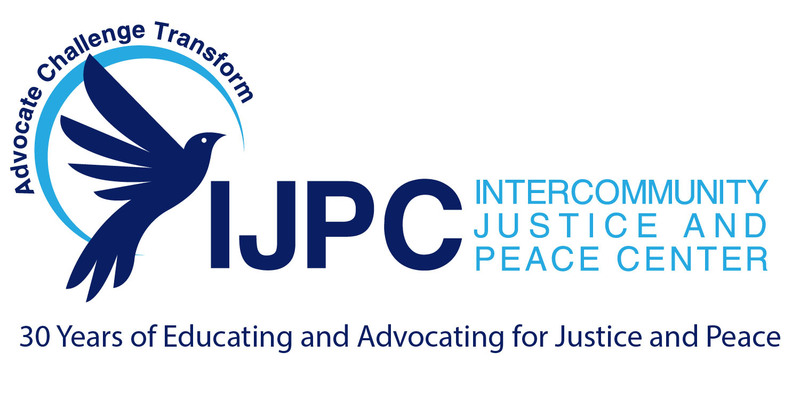 For over 30 years, the Intercommunity Justice and Peace Center (IJPC) has been educating and advocating for peace, challenging unjust local, national, and global systems, and promoting the creation of a non-violent society. Their first public peace dialogue in 2006 covered the Iraq and Afghanistan wars, and such dialogues are continued today to address similarly timely and divisive issues ranging from the death penalty, to immigrant rights. 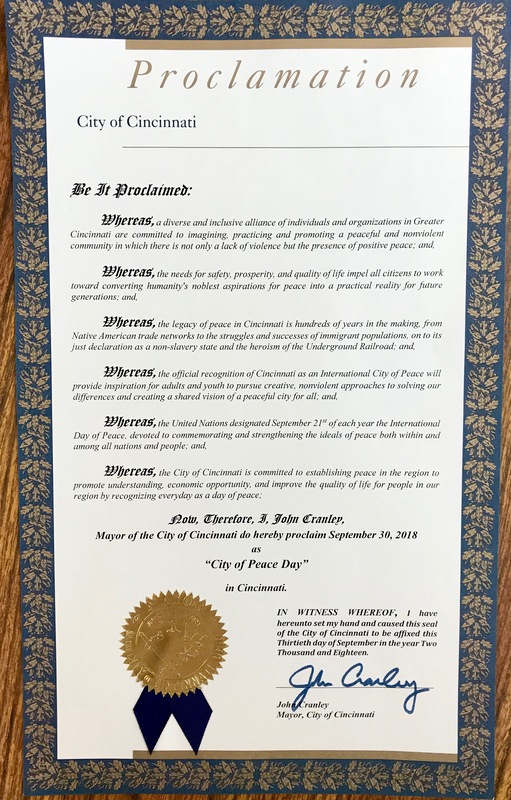 To co-create and sustain a Culture of Peace in Greater Cincinnati to improve the quality of life for all residents and connect our city to a global community of peace-builders. 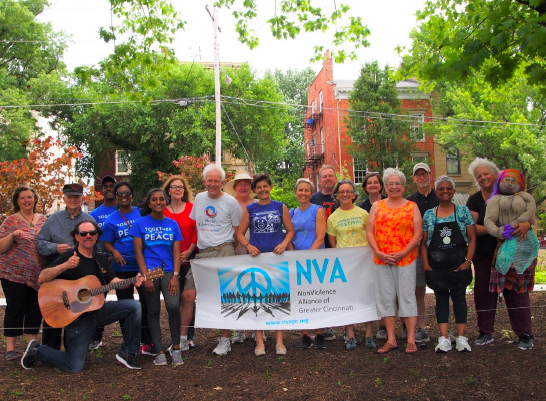 Creating an environment and culture of peace in Cincinnati and beyond, that is sustained at the individual, collective and institutional levels through daily peacebuilding choices. Fostering education that promotes the values, attitudes, and behavior inherent in a Culture of Peace, including conflict prevention and resolution, dialogue, consensus-building and active non-violence. Embracing humanity’s interconnectedness and inner oneness, by working together as an inclusive diverse alliance of individuals and organizations committed to creating a more peaceful community. On June 24, 2018, nearly 2000 adherents of 24 faith communities, representing 12 world regions, came together as one spiritual family. They congregated at Xavier University, united under the theme: Compassion through Action. It was the most inclusive gathering of faith traditions ever assembled in our region’s history. 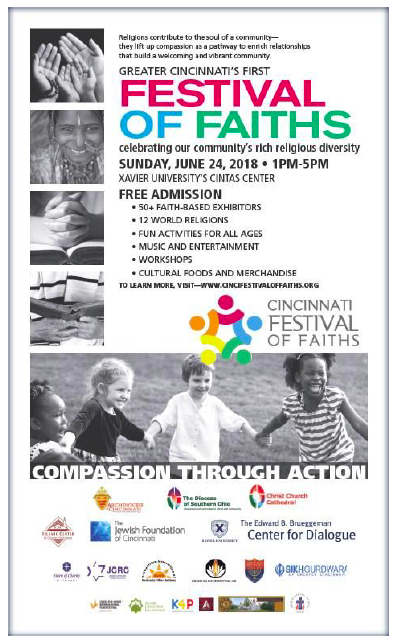 It was the Festival of Faiths! 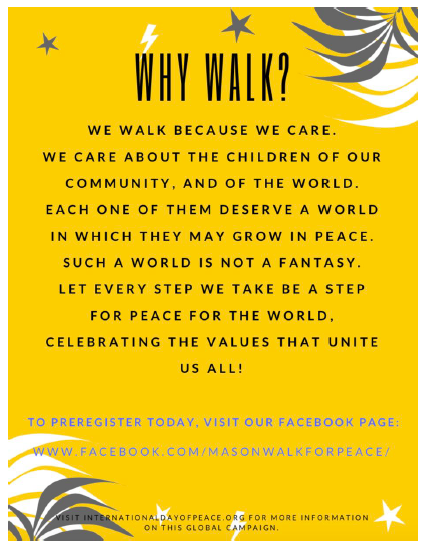 Sponsored by Xavier University, the Walk for Peace is a day event that highlights our individual and collective responsibility for the progress of humanity. On this day, we strive to bring peace into our daily lives, and the lives of others in our local-global communities by recognizing that we are united by something that we all believe in: values. These include: love, truth, righteousness, nonviolence, and peace. The Walk for Peace is both an opportunity for a co-creative celebration, and for our commitment to continuing our personal and planetary peace building. The event is concurrent with the UN International Day of Peace; World Peace Day provides a globally shared date for all humanity to commit to Peace above all differences and to contribute to building a Culture of Peace. Walk for Peace a part of the 141 official United Nations recognized World Peace Day events around the globe. While the walk’s central focus is on bringing unity in the Mason area, it includes others from the Greater Cincinnati region as well. The ceremony will begin with a mayoral proclamation for peace. After which, the 5k walk will commence, and an intercultural fair with booths for volunteer organizations, activities, art, music, entertainment will conclude the celebration. Some of our featured organizations include the Red Cross, Catholic Charities, World Affairs Council, Hindu Women’s Network and Education for Ethiopia. 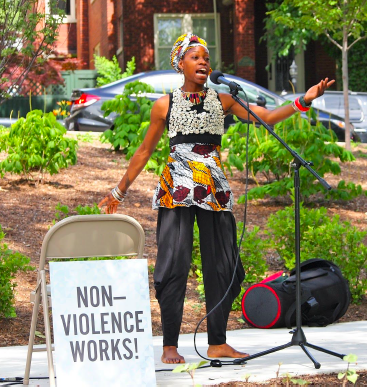 The event celebrated peace and nonviolence with the newly formed NonViolence Alliance of Greater Cincinnati! 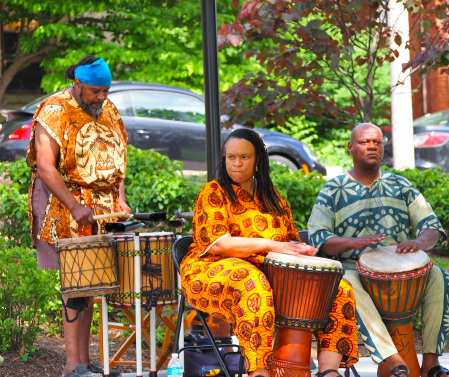 Highlights included music and spoken word (Kim Belew, Angelle Peace) and African drumming and dancing. 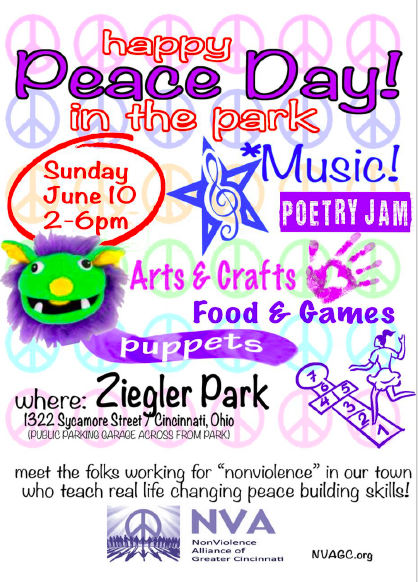 The whole community was invited, with family-friendly activities including arts, crafts and puppet-making, games and education on nonviolence. Originally from Cleveland, Jessie graduated from Xavier University with degrees in both English and political science, along with a peace and justice studies minor. 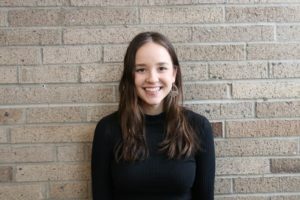 Through her studies and her time spent in the Dorothy Day Center for Faith and Justice, Jessie unpacked questions regarding racial justice, economic inequality, intersectional feminism, and nonviolent movements, among other things. Jessie returns to Cincinnati after working in Columbus for state Senator Cecil Thomas. While there, she dove deep into criminal justice issues and gained a broad understanding of and passion for the reforms necessary to make the system more just, rehabilitative, and effective for all. Jessie comes to IJPC bringing a love for policy, hope in the power of radical imagination, and a readiness to engage with community members committed to systemic change. In her free time, Jessie enjoys cooking, reading, writing poetry, and being active. 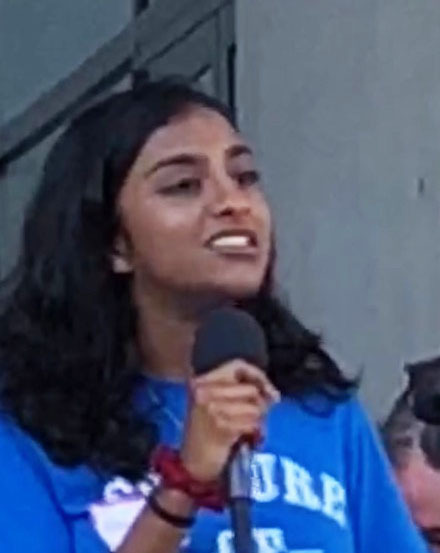 Ahalya Ramesh is finishing her first year at Vanderbilt University where she is majoring in Medicine, Health and Society with a focus on health policies and economies. A Cincinnati native, her passion for peace began at an early age, with it being a fundamental human value imparted to her by her parents and spiritual Sunday school. The seven years she spent working with the refugee community in Cincinnati deepened this passion, opening her eyes to the various forms of inequity and insensitivity systemically tarnishing our society, and solidifying her belief in the universally shared right to peace. 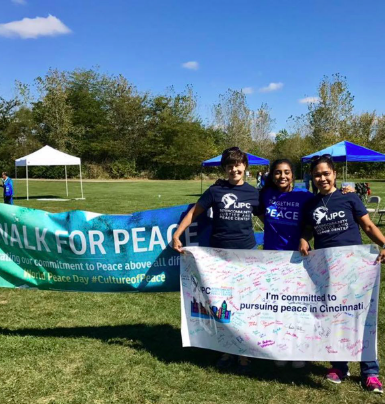 Ahalya now strives to co-create a Culture of Peace in Cincinnati and beyond, organizing marches for peace and working with city government and local nonprofits to establish Cincinnati as an International City of Peace. 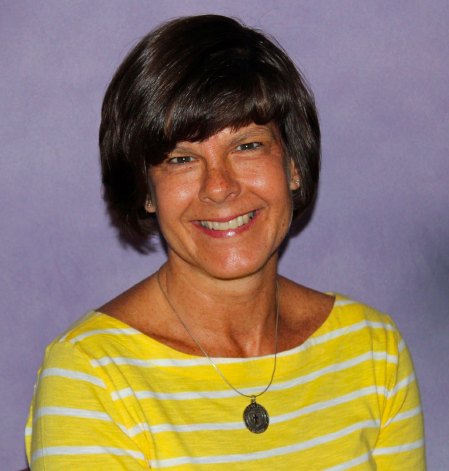 Sr. Andrea Koverman holds two master’s degrees and National Board Certification in education and left a career in Coastal South Carolina to become a Sister of Charity of Cincinnati in 2012. She spent more than two decades serving impoverished and children with special needs in the Gullah communities of the Sea Islands before relocating to a border town near El Paso to begin formation. There she was able to cross into Mexico regularly and experience first-hand the economic and cultural violence that drive people to migrate to safety in the U.S. Sr. Andrea has witnessed the same conditions while doing mission trips and visits to Guatemala, Haiti and Palestine. She clearly heard God call to serve the most marginalized and vulnerable members of our human family and to work towards a more just, compassionate and peaceful world for all to enjoy. Now living in Cincinnati, Ohio, Sr. Andrea lives with three of her sisters in the diverse but needy neighborhood of East Price Hill. She uses her background to develop education and advocacy opportunities around critical social justice issues at the Intercommunity Justice & Peace Center. Cincinnati is a city in the U.S. state of Ohio and is the government seat of Hamilton County. Settled in 1788, the city is located at the northern side of the confluence of the Licking and Ohio rivers. The city drives the Cincinnati–Middletown–Wilmington combined statistical area, which had a population of 2,172,191 in the 2010 census. 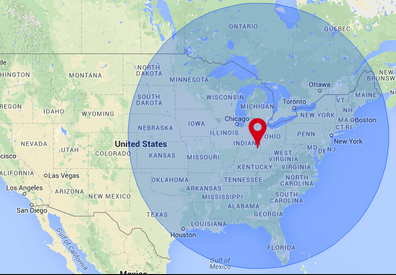 With a population of 301,301, Cincinnati is the third-largest city in Ohio and 65th in the United States. It is the fastest growing economic power in the Midwestern United States based on percentages and the 28th-biggest metropolitan statistical area in the U.S. Cincinnati is also within a single day’s drive of two-thirds of the United States populace. In the nineteenth century, Cincinnati was an American boomtown in the heart of the country. Throughout much of the 19th century, it was listed among the top 10 U.S. cities by population, surpassed only by New Orleans and the older, established settlements of the United States eastern seaboard, as well as being the sixth-biggest city for a period spanning 1840 until 1860. 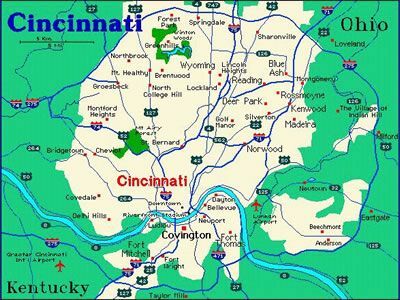 As Cincinnati was the first city founded after the American Revolution, as well as the first major inland city in the country, it is regarded by some as the first purely “American” city. Cincinnati developed with fewer immigrants and less influence from Europe than east coast cities in the same period. However, it received a significant number of German immigrants, who founded many of the city’s cultural institutions. By the end of the 19th century, with the shift from steamboats to railroads drawing off freight shipping, trade patterns had altered and Cincinnati’s growth slowed considerably. The city was surpassed in population by other inland cities, particularly Chicago, which developed based on strong commodity exploitation, economics, and the railroads, and St. Louis, which for decades after the Civil War served as the gateway to westward migration.